When Goldie was very young (age 8 to 12), it was Figure Skating that got her attention. She loved the costumes, music and routines put together for the yearly Ice Skating Carnivals in her home town of Salmon Arm, British Columbia, Canada that she participated in! Next was playing the guitar and singing with her sister, Rhoda. Together they made beautiful music and sang as a duet in churches and homes for the elderly. Goldie spent her high school years in the states; Utah mostly with her final year in Idaho. She continued her singing by joining a Choir, a Girls Chorus, a Trio, and even a Men’s Quartet when they needed a 1st Tenor. Not used to singing solos, Goldie braved one by singing “To You With Love” at her High School Graduation, a creative rendition of the theme song from the movie “To Sir With Love”, starring Sydney Poitier. 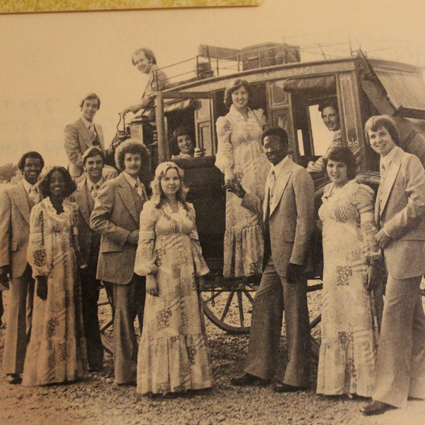 Before deciding on college, Goldie had auditioned for a professional singing group in California called The Heritage Singers New Creation. The summer after her graduation, she got the call she was hired as an alto to sing with them. Excited by this wonderful opportunity, she flew down, signed a contract for the year, cut an album with the group and went on tour. They toured the eastern states of the USA, and Goldie loved the life of a musician on the road; however, this experience was to be somewhat short lived. Tragedy struck in Goldie’s life during that year, her sister Rhoda died. This was traumatic for the whole family, and Goldie, once back home in Canada after her year with the singing group, decided she couldn’t return. She was unable to sing or play the guitar for many, many years after that.